On Tuesday 7 March, Christopher David Price was found guilty of working without a licence at Cardiff and Vale Magistrates Court. He also plead to being in possession of a false document (purported to be an SIA Licence). In June 2016, a Security Industry Authority (SIA) investigations officer, accompanied by the Police, checked venues including a bar in Cardiff as part of a night time economy operation. The officers observed Christopher David Price at WOW Bar on Churchill Way in Cardiff, working on the door with what appeared to be an SIA licence. The SIA investigator checked Price’s alleged licence. Although the photograph looked like Price, it was a laminated paper photocopy intended to look like an SIA Licence. When checked on the SIA’s Register of Licence Holders (ROLH), it was established Christopher Price did not hold an SIA licence. Price was removed from the door supervisory duties at the venue. After further investigation, it became evident that Price had worked as an unlicensed door supervisor at WOW on 6 earlier occasions, using false SIA licence details. Price pleaded guilty to working without a licence on 7 occasions, contrary to Section 3 of the Private Security Industry Act 2001. He also pleaded guilty to using a false document which purported to be a SIA Licence, an offence under the Forgery and Counterfeiting Act 1981. 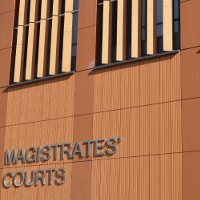 In sentencing, the Magistrates questioned whether Price would have continued with the unlicensed work had he not been caught using the false document. He added that door supervision was an important and responsible job that required the necessary training, which Price had not undertaken. Price received a custodial sentence of 12 weeks, suspended for 12 months and was sentenced to 100 hours unpaid community work. He was also ordered to pay £1000 in costs and a victim surcharge of £115. “The SIA robustly regulates the security industry and will seek to prosecute those who chose to ignore the legislation in place. “Christopher Price was not licensed to work as a door supervisor, and yet he knowingly used a false SIA licence on a number of occasions. He deceived the company who employed him, and the general public who frequented the premises, by pretending that he was a licensed individual.